Best Ice Fishing Fish Finder: A wide variety of fish finding devices is available today, and it is easy to get confused by all of the options and features. Every device has its advantages and disadvantages, so to help you find one that is right for you, FishFinderReviews.net creates its top-lists. 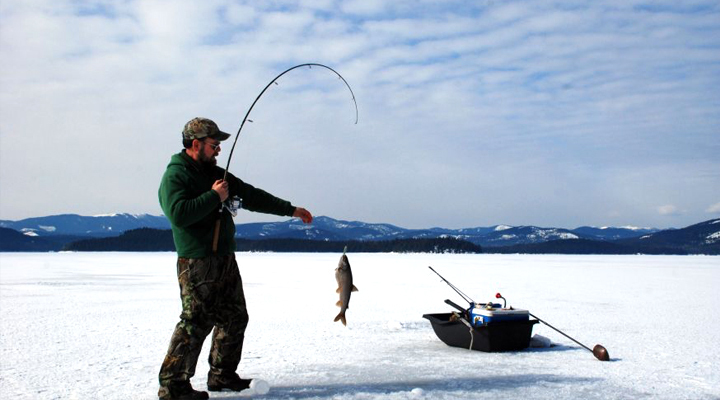 It’s abundantly clear that ice fishing, which is done on the frozen surface of the water rather than in a boat, is a distinct kind of angling, and it’s only logical that a special kind of fish finder might be required. At the same time, you may have stumbled across? universal? 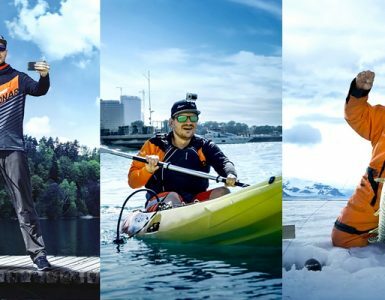 fish finders that claim to be functional in any conditions. When you are deciding on an ice fishing fish finder, you should not neglect either category, and both are represented in our 10 best fish finder for ice fishing list. Keep in mind that all the devices that we mention are produced by the world’s leading marine electronics manufacturers. But what is it that makes our choices interesting? We started off by coming up with a list of the features for the best fish finder for ice fishing: portability, ability to withstand cold weather and a long-lasting battery; we also gave special attention to devices that offer greater wattage and multiple beams and frequencies, are multifunctional and sell for a reasonable price cost. The problem is, some of these characteristics are mutually exclusive. The more compact a device is, for example, the less likely it is to be multi-beam and powerful. Greater functionality means a higher price. Cold weather resistance and long-lasting battery life usually mean increased size and weight. As a result, the products that we chose up for our top-10 list ended up being – let’s say, different. They combine the features that we would like to see in an ideal device in varying proportions and offer their own selections, any of which may be suitable for a particular purpose. We are pretty sure that one or more of these devices will offer the functionality that you’re looking for. Let’s get started! FishHunter Military Grade Portable Ice Fishing Fish Finder: This castable, single-frequency versatile unit with an 8-hour battery, the depth range of 133 feet (40 meters) and a special ice fishing view-mode for your iOS/Android smartphone/tablet. Check our review of FishHunter Military Grade fish finder! Deeper Smart Portable Ice Fishing Fish Finder: (Best Fish Finder for the Money) This castable dual-frequency versatile fish finder that remains functional from 0 to 104 degrees Fahrenheit (-20 to 40 Celsius), this device comes with a multifunctional app for your iOS/Android smartphone or tablet. You can check our review of Deeper Fish Finder. FishHunter Directional 3D Portable Ice Fish Finder: This is an improved, dual-frequency version of the FishHunter Military Grade Portable Fish Finder, 3.0 that features 5 transducers, 4 sonar views (including ice fishing) and can reach up to depths of 160 feet (49 meters) depending on the water and weather conditions. Vexilar FL-8se Genz Pack Portable Ice Fishing Fish Finder: This Vexilar portable (the size of a 5-gallon bucket) dual-beam fish finder with six depth ranges going up to 120 feet (36 meters) comes in a weather-proof case and includes a dual-beam transducer. Vexilar FL-18 Genz Pack Ice Fishing Fish Finder Flasher: This model of Vexilar Genz Pack flasher has a smaller-cone transducer, making it better for precise readings of smaller areas to the depth of 300 feet (91 meters) for the customized version, and 200 feet (61 meters) for the standard one. MarCum Showdown 5.6 Digital Sonar Ice Fishing Fish Finder: This dual-beam, single-frequency 1000W digital system features an unusual vertical display, 0.5-inch target separation precision and a battery that keeps working for an entire day; you can check our review of Marcum Showdown. Humminbird ICE-55 Ice Fishing Fish Finder Flasher: This famous flasher has a 5-inch display, selectable dual-frequencies sonar and a depth range of 200 feet (61 meters); it’s a bit on the expensive side, but extremely reliable. 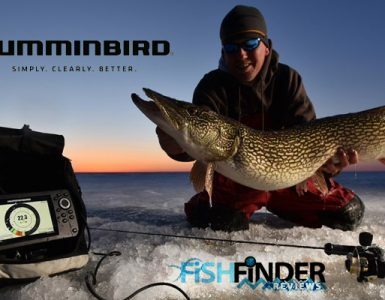 Check our review of Humminbird ICE 55! MarCum LX-7 Ice Fishing Sonar Fish Finder: This 600W, dual-beam fish finding system features an impressive 8-inch color display, zooming options, and 0.5-inch target separation, which makes it quite expensive, but well worth the money. MarCum Showdown Troller Ice Fishing Sonar Flasher: This handheld, 1000W ice fishing flasher with a 20-degree transducer and 2-inch target separation runs on up to 20 hours on 6 AA batteries. Versatility is definitely a plus, though a specialized unit is more likely to perform its specific tasks better. There is also the issue of power and versatility since many casual anglers will have no need for a deep-penetrating device. Apart from that, the versatile fish finders that made it onto our list turned out to be the few castable ones that are currently on the market. You probably already know the positives about these devices: they are wireless, compact and connect to your iOS/Android phone or tablet, which means that you can get a really nice display from just a tiny device. These castables are not the most powerful units you will find on the list. 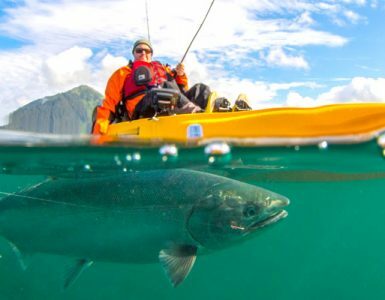 Their maximum depth range is about 130-140 feet, but their performance has been improving over the past year. Flashers: A flasher is an ice fishing fish finder that, rather than providing you with graphs of the data it measures, offers only information about fish and other objects under the ice at one particular moment. Such an approach may seem outdated, but this kind of fish finding device actually remains the most popular among ice anglers. What could be more convenient than a fish finder you can hold in your hand? Handheld devices are typically less powerful, it’s true, but in addition to being more portable, they are usually less expensive. We were able to identify a first-class handheld device that combines impressive wattage and performance and high portability, though at a higher-than-average price. Our choice here is less powerful than the sonar system discussed above, and its performance may in some cases be less than that achieved with some of the flashers, but it is still unusually powerful for its size. This is a specific mix for high-tech lovers who want something unusual and are willing to pay for it. As you can see, the possibilities offered by modern manufacturers of fish finders are many indeed. We grouped the devices to show some of the main trends in the industry today, but each of the units deserved individual discussion. We have introduced them – now it’s up to you to compare their advantages and disadvantages to find the one that is suited to your kind of fishing. Some are exceptionally affordable, while others have remarkable capabilities. Some are very compact, while others offer large and convenient displays. In the end, it is up to you to identify the #1 fish finder for yourself. Get started today looking for the right balance between capabilities, size, and price! I also recommend reading the new fish finder reviews.